We use FRP composite material which has high percentage of close area and is aging resistant, mainly for heavy truck vehicles. In 2006, we started mass production of fiberglass, and have been supplying Hino with fiberglass bumpers for 11 years. The total FRP supplies is about 5000 pieces for one year. We used two FRP colors on the bumper, gray pearl color with white. This not only makes the appearance of fiberglass bumper look beautiful and high-end, but also has the following characteristics. First of all, we have adopted a special process, which makes the dividing line between the two different FRP colors very obvious. Secondly, gray pearl color will appear reflective at night when the two cars are about to meet. It has the advantage of making the driver safer when they are driving. Thirdly, since the density of FRP material is relatively small, FRP weight is 40 percent less than the weight of steel products. As we all know, the lighter the car is, the less oil is consumed. Using glass fiber material not only reduces the cost of oil for car owners, but also is more environmentally friendly. Finally, the fiberglass yield strength and FRP tensile strength of fiber reinforced plastic are higher than the strength of normal steel. More advantages of FRP include that it has good impact resistance, high security coefficient, is aging resistant and corrosion resistant. It has low maintenance rate, and the FRP cost of repair is also low. 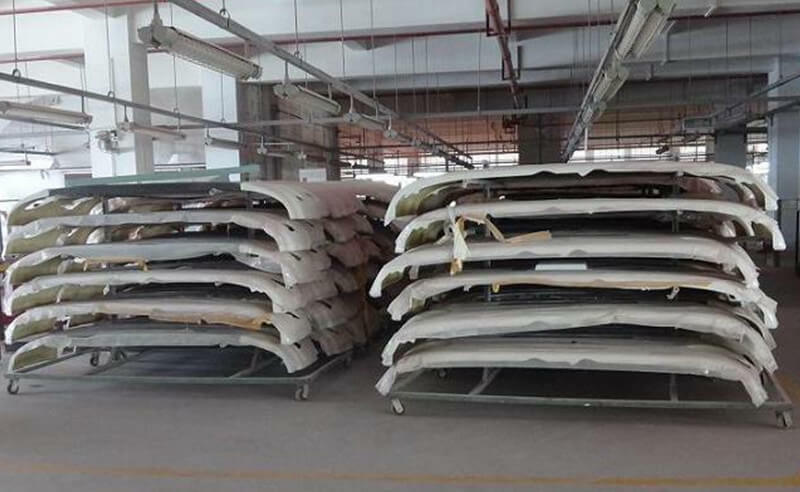 What’s more, we mainly use composite layup process for manufacturing car body parts, certainly including fiberglass hoods, fiberglass jeep tub, fiberglass front end, and so on. Smooth FRP is used to make the fiberglass car parts an attractive appearance and fluent shape. 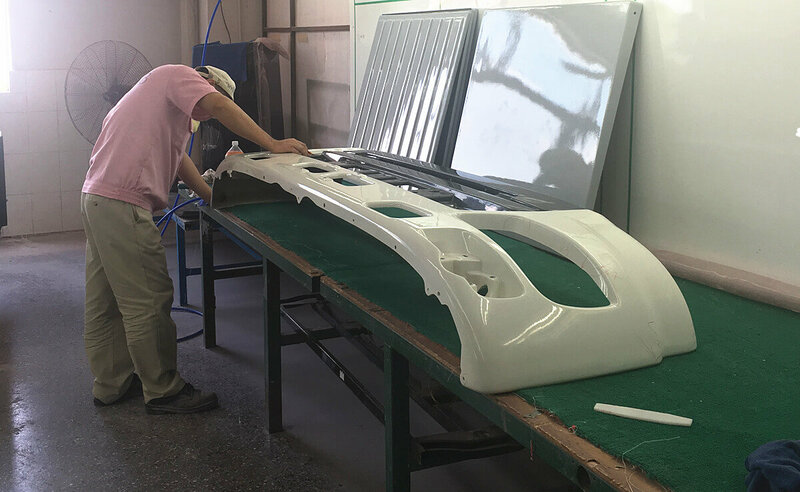 Through our 26 years effort, we can even do integrated manufacturing for big size fiberglass auto parts. 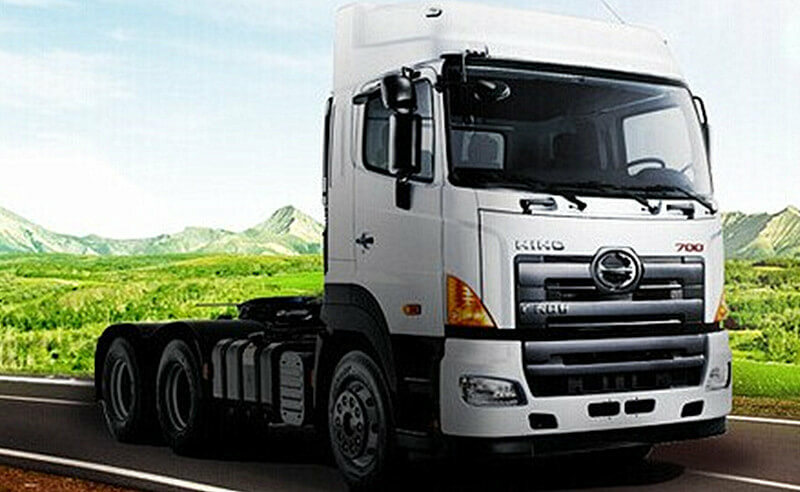 Fiberglass bumpers we produce have been supplying to Hino in China and in Japan.